Printed from http://www.bodytalksystem.com//learn/news/article.cfm?id=864 on Apr 22, 2019. Kudos to You!!! Great Job!!! It has been well over 10 years (Really!!) since a group of dedicated and determined BodyTalk practitioners gathered from around Ontario. We then called ourselves the BodyTalk Development Team. We traveled to have meetings quarterly in Hamilton, Toronto, Barrie and London. Our goal was to inform the public of benefits of the BodyTalk System and to support a growing number of BodyTalk Pioneers throughout our vast Province. We then began to contribute funds towards collective advertising with one popular Health magazine and a ¾ page monthly advertisements and occasion paid advertorials. This enabled expansion to other print media. We used smaller ads and submitted articles to those magazines. Over this time span the magazines published around a dozen articles - with no charge the more we advertised with them. Great opportunity to have your articles published! We felt it was important that the BodyTalk System™ appear within the countless choices of health care options available to the public. Funding from BodyTalk Central and the Affiliate support has now enabled us to add Canada's top Health Magazine - Alive - to our list. 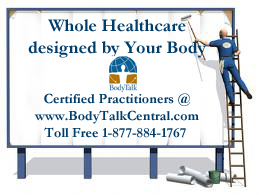 Let's increase circulation of your newly revised newsletter BodyTalk WholeHealthcare which is specifically designed for the public. We'd like to publish your articles and stories to pique the public interest into experiencing your professional touch on their healing journey.